By changeandsassy on Instagram. Submitted by Torley via Twitter. It was a rather eventful weekend here with a film project and then a bit of unexpected excitement around a show at Berkeley Arts last night featuring Pitta of the Mind. In the end, everything went well, though Luna would have preferred less excitement. Here she is coming out of hiding after my friends from the film project left and reclaiming her territory. She is quite fond of this toy piano. I have even heard her press the keys, though I haven’t been able to capture it yet. Video the cat returns, this time with a toy piano. 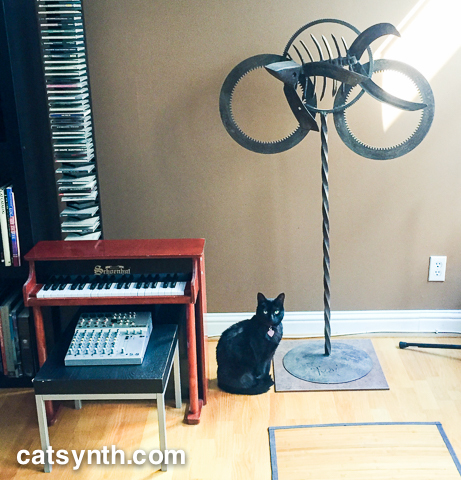 Submitted by The Wiggly Tendrils via catsynth. 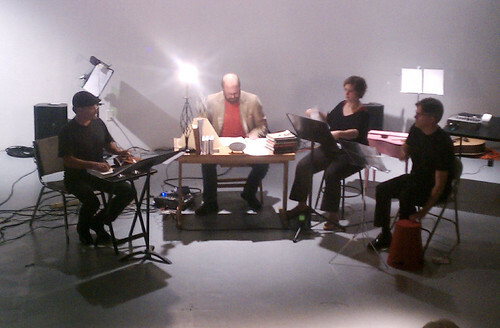 And yes, the toy piano is technically not a synth, but it’s an instrument of which we are quite fond. A bengal with the “very analog” instrument: a classic Jaymar toy piano. My parents found one of these on someone's curbside several years ago – it's amazing what people throw out. When I tried it out, I immediately recognized it as the instrument used in recordings of John Cage's Suite for Toy Piano. Thanks to everyone who has been submitting photos in the past week or so. I'm a little backlogged at the moment, but I will get to posting them all, among all the other articles I want to write for this forum.